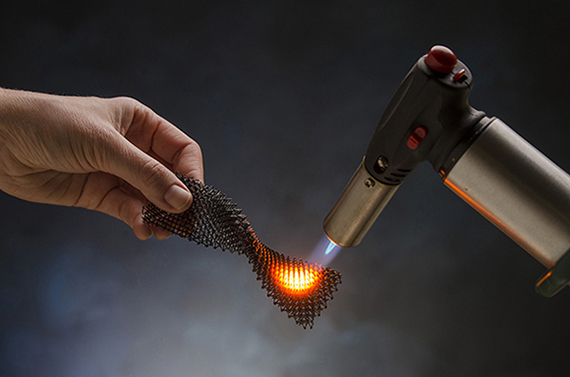 Researchers at HRL Laboratories, LLC, have achieved a new milestone in 3D printing technology by demonstrating an approach to additively manufacture ceramics that overcomes the limits of traditional ceramic processing and enables high temperature, high strength ceramic components. HRL’s Senior Chemical Engineer Zak Eckel and Senior Chemist Dr. Chaoyin Zhou invented a resin formulation that can be 3D printed into parts of virtually any shape and size. The printed resin can then be fired, converting it into a high strength, fully dense ceramic. The resulting material can withstand ultrahigh temperatures in excess of 1700°C and exhibits strength ten times higher than similar materials. Ceramics are much more difficult to process than polymers or metals because they cannot be cast or machined easily. Traditionally ceramic parts are consolidated from powders by sintering, which introduces porosity and limits both achievable shapes and final strength. “With our new 3D printing process we can take full advantage of the many desirable properties of this silicon oxycarbide ceramic, including high hardness, strength and temperature capability as well as resistance to abrasion and corrosion.” says program manager Dr. Tobias Schaedler. The novel process and material could be used in a wide range of applications from large components in jet engines and hypersonic vehicles to intricate parts in microelectromechanical systems and electronic device packaging. The HRL team’s research paper, “Additive Manufacturing of Polymer Derived Ceramics,” has been published in the January 1st issue of Science. Photo by Dan Little Photography. © 2015 HRL Laboratories. HRL is currently looking for a commercialization partner for this technology. If you are interested, please contact: innovation[at]hrl.com.